Growing Broccoli in a Container: Having maintained container gardens for many years, it never fails to amaze me as to how many people are still under the impression that this style of gardening is limited only to growing small herbs and ornamentals. For those of you out there that feel this way, you haven’t the slightest clue as to what you’ve been missing out on! In fact, if the proper planning is done to maximize space, container gardening can be a sustainable means to providing yourself with edible fruits and vegetables throughout the season. Even larger crops like broccoli can be easily tamed to grow successfully in a pot. This brings us to our topic of the day, Broccoli in the Container Garden. Come learn the basics to planting, growing, and harvesting broccoli in containers. 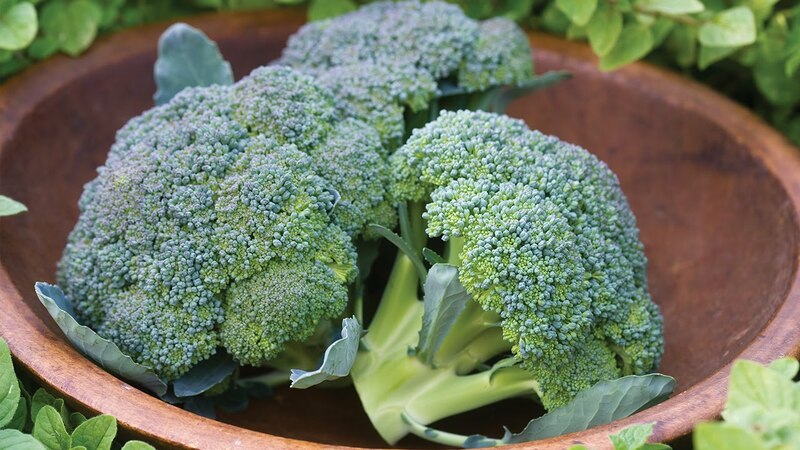 Containers – Since broccoli is a larger and heavier feeding vegetable crop, a container size of at least three gallons should be provided for every broccoli plant grown. Potting Soil – As a heavy feeder, broccoli will also need a potting soil that is high in nutrition. An organic potting soil that has been amended with a good amount of nutritious compost should be sought. Besides nutrition, broccoli also prefers the soil to be light, well aerated and have good drainage properties. Fertilizer – Generally speaking, fertilizer is not as important. If you started off with a premium potting soil, there should only be a need to fertilize your broccoli plants once or twice during their life cycle. For this, I recommend an all purpose organic fertilizer with the addition of micro-nutrients such as boron and magnesium. Sunlight – Although broccoli is a larger and fast growing vegetable crop, its need for direct sunlight is a little less than many other similar sized plants. Shade tolerant to a certain degree, broccoli plants will thrive with a minimum of 8 hours of direct sunlight daily. Temperature – Broccoli tends to bolt (flower) when the temperatures rise above 75 degrees Fahrenheit. When broccoli bolts, there is no harvestable produce to be had. To keep your broccoli plants producing, grow only in the cooler temperatures of spring and autumn. In order to maintain an efficient container garden, it’s important to select fast maturing broccoli varieties. By selecting speedy cultivars such as Atlantic, De Cicco, or Waltham #29, you’ll be able to harvest full size broccoli heads in as little as 50-65 days from sprouting! Quick growing cycles like these will free up your containers for subsequent plantings. Start germinating broccoli seeds indoors, 4-7 weeks before your area’s average last frost. The seedlings will be grown indoors only for a short period of time, after which they’ll be transplanted to an outdoor container, 2-3 weeks before the average last frost. Fill seedling cups with potting soil. Plant two broccoli seeds per container at a depth of 1/4-1/2 inch deep. Cover and water thoroughly. Place in a warm area and keep the soil moist, but not drenched. The seeds should germinate within 5-10 days. At this point, move your new seedlings to a well lit area. South facing windowsills or artificial grow lighting will do fine. If both seeds in a container sprouted, thin out the smaller of the two. The whole point to planting two seeds is to be sure that at least one will sprout. For the next 3-4 weeks, keep the soil evenly moist and provide plenty of light for the seedlings. Once your seedlings have reached an age of 3-4 weeks, they will need to be moved to their final container and their new outdoor home. While transplanting can be done in a matter of minutes, the transition from indoors to out takes a bit more time. This transition can better be described as the process of hardening off, which is essentially the practice of acclimating your plants to the outdoor environment. Transplant each broccoli plant from its seedling cup to their final three gallon containers. Starting three weeks before your average last frost, begin to harden off your broccoli plants. Basically, you’ll want to take your broccoli plants outside for an hour to start, then each following day increase the amount of time they spend outside. Within two weeks time, your broccoli plants should be fully acclimated and be spending their whole day outside. At this point, the plants should only be brought indoors if the temperature is expected to drop below freezing.